My Pressure Cooker Chicken wings sauce is made from a combination of ingredients including hot sauce, vinegar, spicy brown mustard, garlic and Worcestershire Sauce and some other spices and it’s finger lickin’ good! 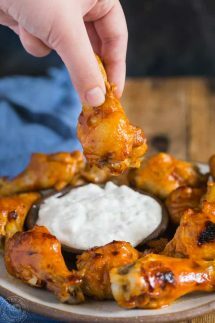 My wings sauce is similar to Buffalo Wings (so I’m calling it ‘Buffalo Style’ ) but it’s not the authentic Buffalo wings sauce, however, it’s very tasty and my whole family loved it! 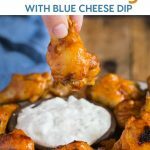 The chicken wings are served with a delicious homemade Blue Cheese Dip on the side, it’s is a classic pairing with Wings and you can throw in a few celery sticks if you want too! There are three parts to this recipe but I promise it’s really easy and is a perfect recipe for those who are brand new Instant pot users and more experience pressure cooker people. The first thing we need to do is make up the blue cheese dip, it’s simply a matter of mixing the blue cheese crumbles, sour cream, mayonnaise, red wine vinegar, lemon juice, garlic and salt and pepper and mixing it well together. I think it tastes best if you can let the flavors develop while it sits in the fridge for a couple of hours. Next, you need to make the sauce for the wings. Again this is super easy and all you need to do is add the hot sauce, vinegar, mustard, Worcestershire sauce, butter and seasonings and cook in a pan for a few minutes over a medium heat until the sauce is smooth. Cooking the pressure cooker chicken wings is really easy, you simply add a cup of water and put the wings into the pressure cooker in a steamer basket, put the lid on and cook for 5 minutes at high pressure and then let the pressure release naturally. When the wings have cooked the last thing you need to do is simply put them on a rack over a sheet pan and generously brush on the sauce and give them a few minutes under the broiler until they get nice and sticky and then turn the wings over and apply more sauce and repeat as before. Can I get Crispy Chicken Wings in the Instant Pot? I see a lot of people asking this questions in various forums and the short answer is no, you can’t get crispy chicken wings in the Instant Pot, in fact you can’t make crispy anything in the Instant Pot. 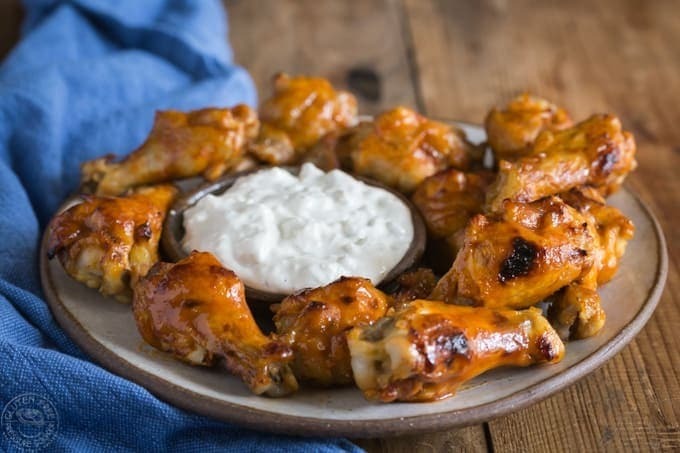 When you cook chicken wings or other meat under pressure you are cooking it with steam rather than in a dry heat environment like your oven or grill, so it’s not possible to get crispy skin. You can, however, put the chicken wings under the broiler after it’s been pressure cooked like I’ve done in this recipe and that will help the sauce get good and sticky but it still doesn’t really make them crispy. This is not a problem for me and I love the convenience of cooking them in the pressure cooker so I think as long as your expectations are realistic about the end result, you’ll be totally happy with Instant Pot Chicken Wings! More Easy Instant Pot Recipes! My Pressure cooker Ribs with Memphis Style Rub is a real crowd pleaser and so easy to make in your Instant Pot! These were amazing! We were fighting over the last traces of the blue Cheese sauce. The only change I made was replacing the mustard with honey for a hot and honey sauce. Famiy agreed we could eat these once a week. So glad you liked them Tracy! My family love the wings but I’m the only one who likes the blue cheese sauce, all the more for me!! The time doesn’t add up or am I missing a step? Hi Steve, Thanks for commenting! the 20 minutes refer to the total average cook time including the time it will take to come to pressure (about 10 mins) 5 mins at pressure, and another 5 waiting for the pressure to drop. The programmable time for 5 minutes is listed in the recipe instructions.